Classic Rock’s Malcolm Dome has reviewed the band’s set at Metropolis Studios recorded live for the ITV Legends series last December. ‘This is intimate ‘ says a slightly shocked Geoffrey Richardson and everyone here at the first of the ITV Legends gigs can only agree with the Caravan man. There are just 100 or so fans packed into a very small space with everyone virtually on top of the band. At first Caravan seem rather nervous and understandably so. Not only is their first gig in five years but thanks to the adverse weather conditions their rehearsal time before the show had been cut to a single day. Live without a net indeed. It’s with the incomparable Golf Girl that Caravan get into their stride all anxiety banished as Richardson and new drummer Mark Walker indulge in a quite astonishing percussive battle the former on spoons and the latter on washboard. That might sound like some sort of music hall comedic sketch but works brilliantly. From there on the band ably rise to the occasion with a wonderful exposition of their craft. Nightmare allows Richardson to show of his skills when playing the violin almost like a lead guitar while on both Smoking Gun and Hello Hello Pye Hastings displays a calm class as he leads from the front. As if to prove that this is no one-off reunion the band also introduce two new songs. Both Fingers In The Till and I’m On My Way sound like early Dire Straits meets Asia and suggest that Caravan aren’t yet ready to become just a nostalgia act forever reliving the early 1970s. This pair are so new that Hastings is forced to put on his spectacles and sing the lyrics from a crib sheet. Not that anybody objects. The unquestioned highlight though is appropriately enough the last track the inevitable Nine Fee Underground. It’s a beautifully balanced epic that gives all of the musicians here including Jim Leverton and keyboard player Jan Schelhaas the opportunity to display their virtuoso skills but also to shine within the song’s strict musical structure. Such is the impact of this climax that when it’s over the crowd take a split second to recover from the hypnotic spell before giving Caravan their rightful ovation. But just when you think it’s over Walker grabs a microphone to offer an impassioned spontaneous tribute to founder-member Richard Coughlan. Although present behind his drum kit for the whole set Coughlan is barely able to contribute anything due to his poor health. But the warmth of the reception he receives at the end is a crescendo. Some might question why Caravan wheel out Coughlan when he can barely walk. But he has come to represent the spirit of the band and its soul. We might never see the drummer play again but having him there appears to act as inspiration for the rest. A new era dawns for the veteran Canterbury band. They has rediscovered their love for the music and a zest for getting on stage again. The coming year could be a vitally important one for them. But they’re gonna have to go a long way to match this sublime performance. 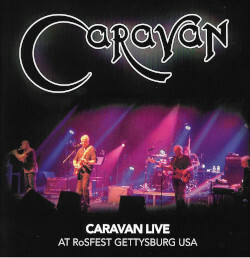 This entry was posted in Reviews and tagged Classic Rock Magazine, Legends concert on January 26, 2011 by caravan. I disagree already you guys got into your stride straight away but it sounds like a positive review. A Good review. Now maybe a few gigs inc one in Dublin. Any news on the likely broadcasts and DVD releases? I notice Bill Nelson and Roy Harper are lined up for future shows. I’m drooling….